This book presents a description of Konso , a Cushitic language spoken by about 250,000 speakers in South - West Ethiopia . It presents analyses of the phonology , morphology and syntax of the language . Aspects of pragmatics including greetings and leave - taking expressions , interjections and ideophones as well as the link between naming of week days and how these relate to the distribution of big markets in the Konso area are discussed . A sample of two texts and a list of singular - plural pairs of nouns with their corresponding gender values is included . The data underlying the analyses are based on the author's native speaker intuition and fieldwork in Konso area where other native speakers are consulted . Konso phonology is characterised by having a full set of labial , alveolar , palatal and uvular implosives but no ejectives which contrasts with what is observed in geographically and some genetically related languages . The language has a rich morphology as evidenced in its nominal and verbal inflection . The work accounts the intricate link between gender and number marking in nominals , it explicates variation in number - and person - marking in affirmative and negative verb paradigms and presents analyses of nominal and verbal derivation . Various clause - linking strategies and the way these relate to person marking of the subject are examined . Word order in simple as well as complex clauses is discussed . 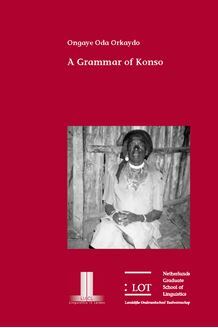 A Grammar of Konso is of interest to specialists in Cushitic and Afroasiatic languages for historical - comparative purposes . It will be a valuable source for typological comparison and for testing theoretical claims .